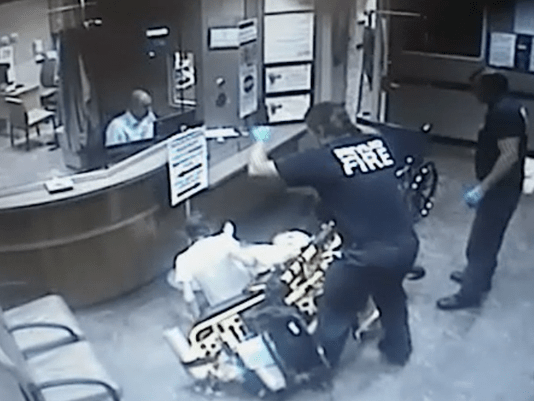 FLORIDA TODAY – A Brevard County paramedic was sentenced to spend a year on probation today in connection with an incident involving a patient being dumped on to a hospital floor. The sentence was handed down today after Kenneth Hallenbeck, 35, pled guilty to culpable negligence in connection with the February 25 incident at Wuesthoff Hospital in Rockledge. Hallenbeck was fired from his position following a March disciplinary hearing and after a surveillance video of the incident surfaced. Rockledge police said that Hallenbeck had asked the patient to get off of a stretcher he was lying on and into a waiting wheelchair. The patient, 49-year-old James Slater, refused, prompting Hallenbeck, an 11-year veteran of Brevard County Fire Rescue, to flip the stretcher over, tossing Slater to the floor in front of several witnesses. “For me this feels like a hate crime and due to the nature of my illnesses, I feel that I have been discriminated against,” Slater later told the court in a written statement. Hallenbeck was arrested and charged with abuse of an elderly or disabled person but that charge was reduced to culpable negligence. Slater said he called 911 for help and noted that when Hallenbeck walked into his home, he “seemed angry,” Slater wrote in a statement. The victim said that when him to the hospital, Hallenbeck became very irate and demanded that he get off the stretcher and into a waiting wheelchair. “It hurt to move, to walk. I tried to explain this to him but he would not listen,” he said. “He began to curse me and threaten me. Eventually he lifted one side of the stretcher and let me drop to the ground. Not only was I ill, but then I was humiliated in front of other patients, in my under wearing, laying on the ground of the waiting room,” he wrote to the court. Since the incident, the victim said he has troubling trusting health officials. He also said he disagreed with the sentence and believed that the state attorney’s office was not looking out for his best interest. “I am frustrated,” he wrote.